Quilts are valuable because they’re made and inherited by family members, and their significance only increases as time passes. It can be worrisome to store them for long periods of time. Most people know not to store quilts in direct sunlight. But what about storing quilts for several consecutive months? Follow these tips to keep your quilts in pristine condition. Transitioning from an extremely cold to an extremely hot environment can cause condensation to accumulate. And quilts will act like sponges to this build-up of water. Eventually, the moisture will eventually dry out the fibers that hold these quilts together. But you control the temperature changes in a temperature controlled unit. So it’s best to get one to store your quilts in. Just keep the temperature consistent, and you’ll be fine. Quilts are known to sweat in air-tight containers. It’s because the cotton fibers need oxygen to maintain their structure. You may think plastic is the best container to prevent a rodent infestation. But it won’t help the longevity of your quilt. If you store your quilt in a plastic container, it may gain spots. Instead, find a reputable self storage facility, like Infinite Self Storage, and roll up your quilt in a furniture cover. Either suspend the rolled up quilt from the ceiling or find a space long and wide enough to lay it flat on the ground. 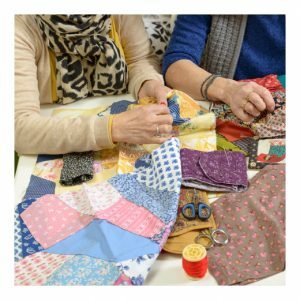 Folded quilts can acquire permanent creases which will breakdown the fabric. So it’s best to either store your quilts flat or suspended. Infinite Self Storage has a packing supplies store at most of its facilities. Contact your local Infinite Self Storage professional staff for more information on storage techniques and self storage unit availability.